Dirndl shoe ballerina colour black. Suede in combination with patent leather. Retro Style sends greetings. Unusual traditional costume shoe by Spieth and Wensky, which consciously dispenses with traditional elements and can therefore be worn excellently with all dirndl types. 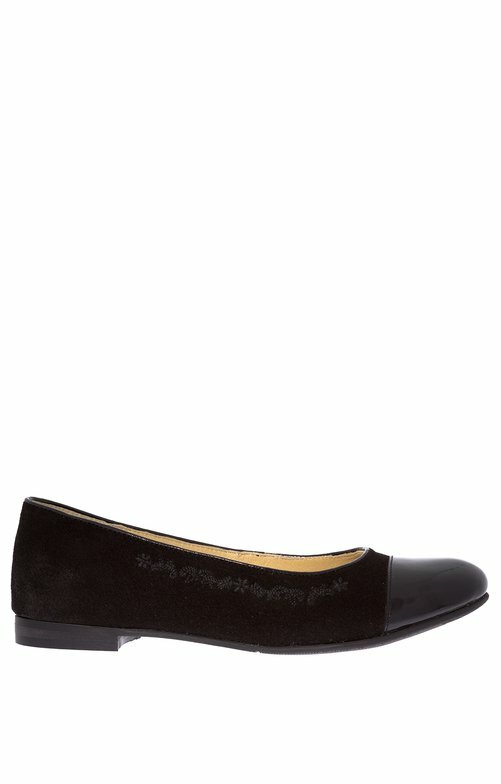 Classic ballerina shape in black suede. The toe cap on the front is made of finely polished patent leather. The non-slip fine outsole ensures good kick even when dancing and the leather interior processing promises guaranteed well-being even in summer. The heart in the pad is padded and relaxes the foot while wearing.